In the Krabi province of southern Thailand, Railay Beach is two beaches in one—Railay East (Sunrise Beach) and Railay West (Sunset Beach). Active types head east for limestone cliffs that soar above the sand to form a world-class rock-climbing face. More of a beach bum?Unwind on the golden sand of Railay West, whose jade bay is flanked by two towering limestone boulders. January is the height of the cool season; considering that it can still hit 95 degrees, this is the month to be here. Water temperature: 80 degrees. Where to stay: The Rayavadee Premier Resort Krabi, 100 luxurious pavilions in the palm groves of Ao Nang, just south of Railay (66-75/620-740; www.krabi-hotels.com; doubles from $900). Where to eat: One of the many budget-friendly restaurants that line both sides of the beach; CoCo, on Railay West, has a particularly happening scene (66-75/612-730; lunch for two $15). What to do: Go caving in Diamond Cave; the Hot Rock Climbing School offers courses and rents equipment (66-1/677-3727; $33 per day). Don't miss: The sunset at Sunrise Beach (yes, that's right), when the light seems to set the cliffs on fire. If beach-going in Brazil is a religion, then visiting Ilha Grande is like praying in the Vatican. Three hours south of Rio, the island has zero roads or cars—and 106 beaches. The best is Lopes Mendes, two miles of sugary sand with a backdrop of misty, mountainous jungle. It takes some work to get here (a 90-minute ferry trip, followed by a 21/2-hour jungle trek), but solitude is your reward. Brazil is crowded in February—locals are enjoying the last gasp of summer, and the entire continent seems to descend on Rio for Carnival—so the shelter of Lopes Mendes is nothing short of miraculous. Average daily temperature: 80 degrees. Water temperature: 82 degrees. Getting there: Take one of the daily ferries from Angra dos Reis on the mainland to Viloa de Abraão, Ilha Grande's main village; follow Trail No. 4 to Lopes Mendes. Alternatively, hire a boat at the dock to take you to Praia Palmes; the beach is a half-hour walk from there. 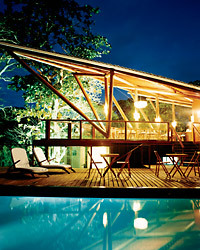 Where to stay: Pousada da Cachoeira, a tropically decorated inn set in the jungle (55-24/3361-5083; doubles from $35). Where to eat: Cesarão da Ilha, in Abraão's square near the church, is a restaurant, a bar, and the island's social center; when it closes at 2 a.m., the caipirinha-fueled party moves down to the beach (55-21/9949-9998; lunch for two $15). What to do: Hike, and hike some more—16 trails, marked by hand-painted wooden signs, crisscross the island. It doesn't get more exotic than this: six miles of blazing white sand just minutes from the domain of monkeys, cheetahs, and lions. Kiwayu Island is part of the Lamu archipelago in northern Kenya; its endless stretch of beach borders the Kiunga Marine National Reserve, whose coral reefs are considered the second-best in the world (after the Great Barrier Reef). A 10-minute sail by dhow, and you're in the Dodori National Reserve on the mainland. Make no mistake—March is a warm month, with temperatures usually in the mid eighties and no breeze, but the stillness enhances the Indian Ocean's clarity, for picture-perfect snorkeling. By mid-April, the monsoon hits with a vengeance, closing everything down till July. Water temperature: 78 degrees. Where to stay: Kiwayu Safari Village on the mainland, with 18 thatched bandas (good enough for recent guests Princes William and Harry) scattered across their own crescent beach (254-2/609-414; www.kiwayu.com; $290 per person, all-inclusive). What to do: Windsurfing, waterskiing, and sailing are included; the deep-sea fishing is superb—but runs a steep $600 a day. The secret to Harbour Island lies 500 feet offshore—a fleet of coral reefs with a distinct pigment that make this three-mile stretch one of only a handful of pink-sand beaches in the world. Those reefs also serve a practical purpose: they're like giant mufflers, shushing and taming the breakers that roar in from the east, and making the sea here as flat as a lake. April, at the end of the high season, precedes the May-to-October drizzles—this month you'll save as much as 30 percent at resorts. Average daily temperature: 74 degrees. Water temperature: 79 degrees. Where to stay: Pink Sands, 25 private cottages that have hosted celebrities such as Julia Roberts and David Blaine (242/333-2030; www.islandoutpost.com; doubles from $655). Where to eat: Get a conch salad to go at Queen Conch, a food shack near the harbor (no phone; lunch for two $42). What to do: Go bonefishing—the national pastime—or dive the challenging Devil's Backbone; Harbour Island Marina can arrange for both (242/333-2427). Don't miss: The Native Boys, a calypso band that plays at sunset between Queen Conch and Harry's Lobster. The numbers are the stuff of dreams: 18 miles of white sand, 300 people. 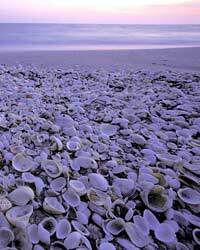 And with 95 percent of Cumberland Island designated national seashore, those figures are kept a reality. There's not an inch of development along the coast, just high dunes backed by thick forest. Wild stallions, pigs, and armadillos roam free. Weather-wise, you can't do better than May: the Atlantic is warm enough for swimming, but the humidity and bugs of summer have yet to arrive. Loggerhead sea turtles also start laying their eggs onshore this month. Tip: To avoid the sunbathers that congregate near the public ferry landing, just walk 20 minutes north. Average daily temperature: 85 degrees. Water temperature: 77 degrees. Getting there: Take the ferry from St. Marys, which deposits you on Cumberland's southern tip; reserve six months in advance (888/817-3421 or 912/882-4335; $16). Where to stay: The stately 17-room Greyfield Inn, the island's only hotel; book at least three months ahead (904/261-6408; www.greyfieldinn.com; doubles from $290, including meals and private ferry transport). Where to eat: Day-trippers can dine at the Greyfield or assemble a picnic at the Riverside Café in St. Marys, across from the ferry terminal (912/882-3466). One of the outermost of Scotland's Outer Hebrides, Harris Island (actually attached to larger neighbor Lewis Island) is remote, windswept, and best known for its namesake tweed. Here, amid a landscape of rocky plains and flat moorlands, is Luskentyre Beach, where heather-covered mountains rise behind white sand dunes. The sky is mostly clear in June, and you'll have a full 18 hours of daylight. Also this month, Harris's main village, Tarbert, holds the Harris Mod, an annual Gaelic festival (44-1859/502-011). Average daily temperature: 55 degrees. Water temperature: 52 degrees. Getting there: Take one of the twice-daily, 95-minute ferry rides from Uig on the island of Skye to Tarbert (44-8705/650-000; about $12). Where to stay: Leachin House, a granite Victorian manor overlooking the West Loch (44-1859/502-157; www.leachin-house.com; doubles from $110, including breakfast and dinner). Where to eat: Scarista House, a Georgian manor where seafood is the specialty (44-1859/550-238; dinner for two $86). What to do: Hike the coast with Northwest Frontiers, which specializes in walking vacations in Scotland (44-1854/612-628; private guides from $175 per day). It's hard to believe that water this glassy and clear—so transparent that schools of silverfish reflect the sun like dancing mirrors—explodes into 20-foot swells three months from now. Most of the year, Waimea Bay can claim the longest surf break in the world. But in July, it's perfect for those whose favorite water sport is floating, with a sandy, gently sloping bottom that trumps the North Shore's other, gravelly beaches. It's also hard to believe this is Oahu. The golden sand isn't blanketed in terry cloth à la Waikiki 50 miles to the south. Come on a weekday, when locals are working, and you might even feel a little lonely. Average daily temperature: 82 degrees. Water temperature: 79 degrees. Where to stay: Turtle Bay Resort, the only resort on the North Shore, fresh from a $35 million makeover (800/203-3650 or 808/293-8811; www.turtlebayresort.com; doubles from $139). Where to eat: Kua Aina, a simple sandwich shop with a major cult following; grab a mahimahi sandwich to go (66-214 Kamehameha Hwy. ; 808/637-6067; lunch for two $15). What to do: Express your derring-do by leaping off the 30-foot jumping rock at the Kaena Point end of the beach. Second Beach, Olympic National Park, Washington, U.S.A. Think of Second Beach—a two-mile stretch of sand punctuated by tidal pools and spire-like sea stacks—as the antithesis of Miami Beach. No sunbathing. No smashball. No attitude, either. Olympic National Park has some 50 miles of wilderness beaches, and while most are out-of-the-way, Second is relatively easy to reach—via a 0.75-mile hike through Sitka spruce and hemlock rain forest from the town of La Push. It rains up to 100 inches a year, so come in August, one of the driest months. And keep your eyes peeled for otters, pelicans, and the occasional bald eagle. Average daily temperature: 70 degrees. Water temperature: 55 degrees. Where to stay: Kalaloch Lodge, just outside Forks, is a cluster of rustic cabins, half of which have ocean views (360/962-2271; www.visitkalaloch.com; doubles from $143). Where to eat: The Thriftway, halfway between Kalaloch and the beach, carries all the basic picnic fixings (950 S. Forks Ave.; 360/374-6161). What to do: Hike the 1.3-mile trail southwest to Third Beach. Don't miss: The sunset, which doesn't begin until about 8:30 p.m.; unlike in the city, there's no pollution to mar the fiery hues. To those who believe European beaches mean painful pebbles, cheek-by-jowl chaises, and a high-pitched lineup of bars, Palombaggia is a ready retort. On the southern coast of Corsica, the bay of white sand is ringed by pine trees and red boulders, and the wild Cerbicales Islands lie offshore in the distance. The beach and its neighboring town, Porto-Vecchio, have become trendy among French and Italians in recent years, especially during the European beach invasion months of July and August. By September, the coast is mostly clear, and the Mediterranean, heated all summer long, is still warm enough for a dip. Average daily temperature: 78 degrees. Water temperature: 73 degrees. Where to stay: Grand Hôtel Cala Rossa, a Relais & Châteaux property on the sandy gulf of Porto-Vecchio, whose chef has a Michelin star under his cap; rates drop by one-third this month (33-4/95-71-61-51; www.relaischateaux.com; doubles from $370). Where to eat: Tamaricciu, the only restaurant and bar on the beach (33-4/95-70-49-89). Don't miss: Porto-Vecchio's hopping nightlife—the biggest and craziest nightclub, Via Notte, is just off the main road en route to Bonifacio (33-4/95-72-02-12). It's like walking on clouds. Because Whitehaven Beach is 99 percent silica, the sand on the three-mile-long stretch is softer than anything you've felt before. October is hot but not unbearably humid, as it can be during the summer vacation season of December through February. Average daily temperature: 85 degrees. Water temperature: 75 degrees. Getting there: Whitsunday is a 30-minute boat ride from its closest neighbor, Hamilton Island; Fantasea Cruises takes you over and serves a buffet lunch on its three-hour excursion (61-7/4946-5496; $35). Where to stay: Hamilton Island, a mega-resort that has accommodations for every budget (61-7/4946-9999; www.hamiltonisland.com.au; doubles from $230). Be sure to pack: Umbrella, hat, and sunglasses—since Whitsunday is a protected national park, there are no shelters from the sun, and no residents to sell what you forgot. What to do: Skip Fantasea's beach volleyball and cricket matches and check out Hill Inlet, a prime vantage point on the island's northern end. You have reached the quintessential Caribbean beach. White sand. Turquoise sea. Palm trees overhead. This is Grand Anse—a two-mile scallop of pearly sand backed by hills wafting cinnamon and nutmeg. November is the end of the rainy season, and there's no humidity or danger of hurricanes. By December, Grand Anse will be packed with American and European sun-seekers, and resort rates will jump by 25 percent. Tip: For maximum quietude, head to the southern end of the beach toward Spice Island Beach Resort; the closest public access road is a mile away, and few non—hotel guests make the trek down. Average daily temperature: 87 degrees. Water temperature: 80 degrees. Where to stay: Laluna, 16 hillside cottages overlooking a cove on the southwest shore (473/439-0001; www.laluna.com; doubles from $240). Where to eat: Coconut Beach, a purple cottage on the beach's north end that specializes in French Creole dishes (473/444-4644; lunch for two $30). What to do: Explore the Bianca C, a 600-foot submerged cruise ship that's the largest shipwreck in the Caribbean; Sanvics Scuba & Jeep Rentals at the Grenada Grand Beach Resort leads tours (473/444-5227; $50 per person). 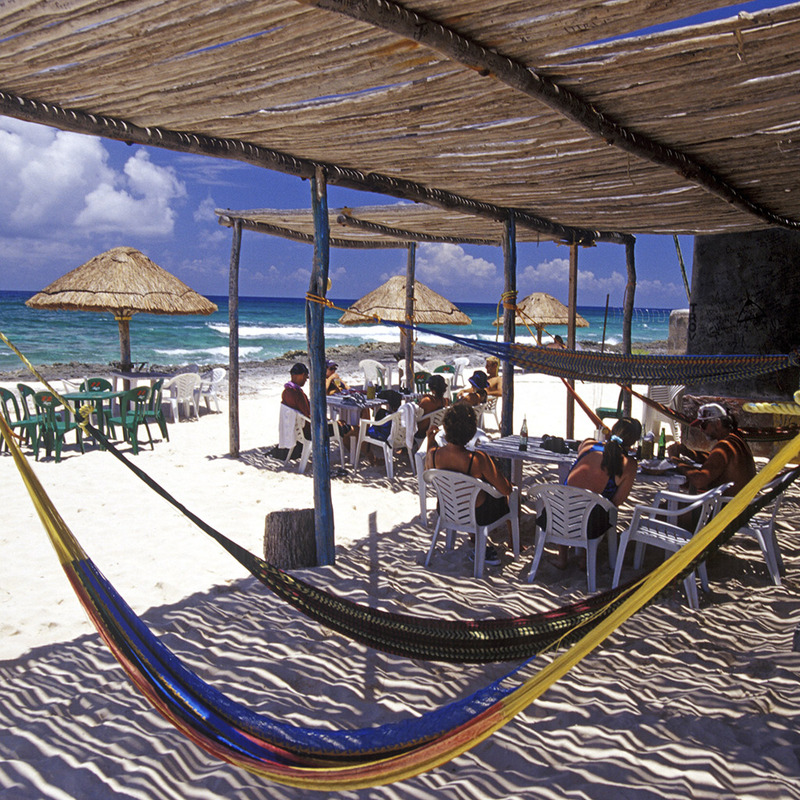 It might not seem like the Mexican beach of your dreams. The sand isn't uniformly golden, and the Pacific's waves and fierce undertow pretty much preclude swimming. But what distinguishes Playon de Mismaloya, 60 miles south of Puerto Vallarta, is, quite simply, nothing. Its more than 40 miles of coastline are absolutely empty. The land here is a designated sanctuary for marine turtles, whose eggs are considered an aphrodisiac delicacy and are sold by black marketers. In the evenings, guests at the area's only hotel—separated from the beach by El Ermitano Estuary—help release newly hatched turtles into the sea. December marks the penultimate hatching month, and the temperatures, usually about 80 degrees, allow for extended hours in the sun. You won't find an emptier beach during the holiday rush. Water temperature: 81 degrees. Getting there: It takes almost two hours in the hotel's four-wheel-drive shuttle; don't bother renting a car. Where to stay: Hotelito Desconocido, which has 30 palafitos—brightly hued bungalows on stilts—around the estuary, some accessible only by rowboat (800/851-1143 or 52-322/22526; www.hotelito.com; doubles from $530, all-inclusive). What to do: Go horseback riding along the beach or bird-watching in the estuary, home to 200 species of birds and other wildlife.